PBL Season 4 began with a high stake clash between PV Sindhu-led Hyderabad Hunters and Carolina Marin-led Pune 7Aces. The first match of the tie feature India' rising star Lakshya Sen ( Pune 7 Aces ) up against Dutch player Mark Caljouw ( Hyderabad Hunters ). The 17-year-old Lakshya outdid his higher ranked opponent quite easily in the first game as he won it 15-10. But Caljouw made a remarkable comeback to win the second game 15-12. Lakshya refused to give up as he started the third game with a 5-0 lead. But he blew it away with repetitive unforced as Caljuow levelled the scores at 11-11. The score was tied at 14-14 and with no extra points rule in PBL, Caljouw forced an error from Lakshya's racquet to win the third game 15-14. With this win, Hyderabad Hunters took 1-0 lead over the Pune 7 Aces. In the second match, Pune 7 Aces placed trump card on the men's doubles duo of Mathias Boe and Chirag Shetty. But they lost this trump match to the duo of Bodin Issara and Kim Sa Rang 15-13, 10-15, 13-15. With this win, Hyderabad Hunters took 2-(-1) lead over Pune 7 Aces. The third match was the second men's singles of the day in which Hyderabad Hunters placed its trump card on veteran Lee Hyun Li. Lee lived up to the expectations as defeated Brice Leverdez 15-14, 15-12 to give his team a confirmation of the victory with a 4-(-1) lead. The fourth match of the tie was the most highly-anticipated one. 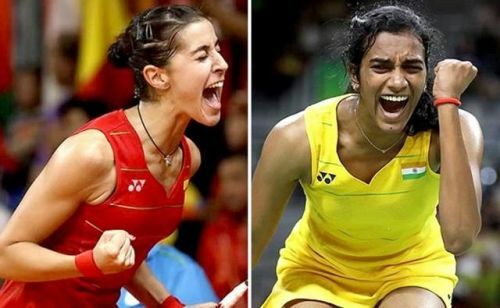 The super match between Sindhu and Marin was a nail-biting encounter as Sindhu won 11-15, 15-8, 15-13. Sindhu made a lot of unforced errors in the first game as she lost it 11-15 but she bounced back strongly in the second game to take it 15-8. In the third game, Sindhu took an early lead of 7-2 but Marin soon levelled the scores at 9-9. After that, the match went point by point as they were tied at 13-13. But Sindhu managed to control her nerves as she brilliantly executed her game to take the third game 15-13 and won the match. This win increased Hyderabad Hunters lead to 5-(-1). 15 14, 15-11 to help their team win the tie by 6-(-1).